Ok, got the frame in the basic form. 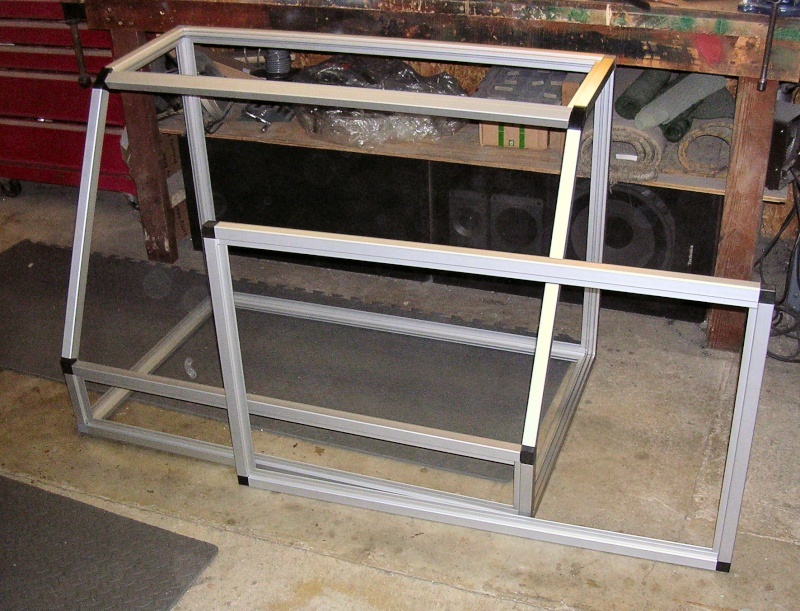 The frame sitting in front is the door and will sit inside (recessed) into the enclosure frame. I originally wanted to do a Piano hinge but not sure, I think I have another sleeker idea. I also had a good thought on using those little gas struts for supports on each side, much like you see used on truck cap doors or a car hatchback or trunk. I think that'll be a nice feature since I wanted the full frontal opening of the enclosure so I can get around comfortably in there. I'm going to hold off on making my coolant "tray" as I'm not positive how I'm doing it just yet (probably going with fiberglass cloth and epoxy), and because I use this machine just about daily, I can't just leave it all disconnected until I figure out what I want to do. I went this long without it, I can make do until then. At least getting the enclosure wrapped around the Taig will help keep my little shop clean. Looks good Dave, is that framing clip together stuff? Yes, it's the 80/20 quickframe but I always go overkill on things and will probably secure it with fasteners on each corner. Especially the door frame. Do you get a beer can holder that clips to that framing? Sort of, it'll be a linear stepper unit that will travel out from behind it where there will be a small refrigerated unit to keep it cold while I'm not drinking it. "Gas springs" are the proper term. McMaster-Carr carries them and light duty ones are very cheap. Looks great so far, keep us posted on the progress! For sometime now, I have been observing the commitment to excellence and detail exhibited on here. You guys are amazing. So, I thought I would show you how the rest of us (at least some of us) do things. Trying to attach some pics of my Taig mill enclosure. Not sure what will happen. But here are the details. The pan is an old photo developing tray that had been stored in the garage for - oh, about 10 years. Drilled a 1/2 inch hole in the bottom to handle coolant return to a 5 gallon bucket containing a small pond pump. The Taig was just a little too deep for the tray so I raised it above the lip on 2" nylon blocks. Drilled through the blocks and workbench to make everything solid. Product called Plumbers Goop works as a great sealent, no leaks. Length wise, the tray works great. the Table (including steppers) can move to either extreme without hitting either side. The enclosure is 1/8" Plexiglas that has been screwed to the sides of the pan (Plumbers Goop again, no leaks). Upper corners are held together with L-brackets. 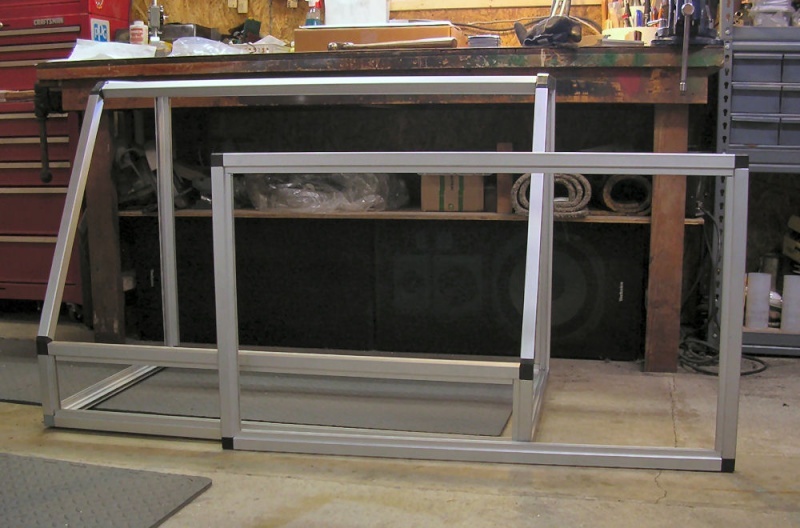 Did not have room for either horizontally sliding or hinged doors so I extended the to about 3 feet with 1/4" aluminum channel. I can raise the front cover straight up (its held up by small hooked springs, not fancy). Actually, it works very well. I can reach straight in and get to any part of the Taig or whatever part I am working on. Not art, but very functional - and the price was right. Bob @ BobsShop - Not associated with Plumbers Goop, Taig, or whatever company built the tray. You're absolutely correct, Sam, I had gas struts on the brains as a friend was just talking about those today. Excellent, Bob, thanks for sharing. My "plan" when I'm ready is to have another "layer" of 80/20 framing added to the bottom to act as the waterproof tray. That way I can work on it and still use the machine until it's ready.